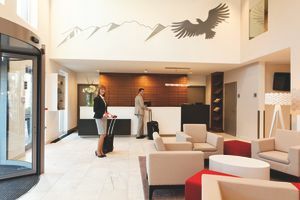 The hotel is surrounded by the impressive Innsbruck mountain scenery and is located directly opposite the Olympia World, Tyrol's largest sports and events center. It is well connected to the center, the train station (1,6km), the airport (5,3km) and the A12 and A13 motorways. 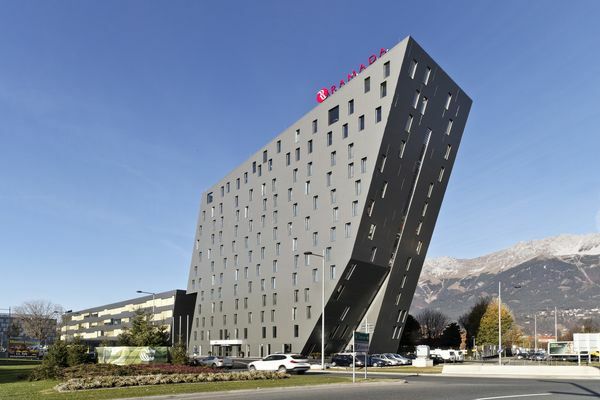 As one of Innsbruck's tallest buildings with 12 floors, it impresses with its impressive architecture and yet blends in perfectly with the surroundings. The hotel is one of the tallest buildings in the city and is easily recognizable for its exceptional architecture. It features a cozy lobby with reception and lounge bar, a breakfast restaurant with panoramic views on the 11th floor and 4 modern function rooms. The panoramic roof terrace can be booked for celebrations of all kinds. On the 12th floor is the fitness and sauna area with Finnish sauna, steam room, fitness room with techno-gym equipment and a massage room. Lift is available. You can use Wi-Fi in the whole hotel for free. Payable on spot: underground parking EUR 12,- per 24 hours. Dog EUR 15,- per night. The 159 modern, air-conditioned non-smoking rooms have bath or shower/WC, telephone, flat screen satellite TV, minibar, safe and free Wi-Fi. The sophisticated architecture and the artistic accents, which give each room an individual touch, will make you feel right at home. Child discount/price for 2 full-paying guests: 0-9 years EUR 22,- per night. 10-99 years EUR 44,- per night.